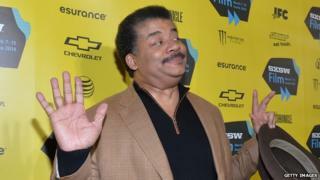 Image caption Neil deGrasse Tyson: nerd alert! As presenter of the popular science programme Cosmos and director of the Hayden Planetarium, astrophysicist Neil deGrasse Tyson has become the leading voice of science and reason for many Americans. But not all. "He is the fetish and totem of the extraordinarily puffed-up 'nerd' culture that has of late started to bloom across the United States," writes Charles CW Cooke for the National Review. "'Nerd' has become a calling a card - a means of conveying membership of one group and denying affiliation with another." "One part insecure hipsterism, one part unwarranted condescension, the two defining characteristics of self-professed nerds are (a) the belief that one can discover all of the secrets of human experience through differential equations and (b) the unlovely tendency to presume themselves to be smarter than everybody else in the world." But the political left's embrace of "nerdom" is "little more than a ruse," he continues. "They have the patois but not the passion; the clothes but not the style; the posture but not the imprimatur." Cooke's portrayal of these supposed fake, liberal nerds prompted a sharp response from the left. "It's easy to see why, despite their supposed enthusiasm for excellence, conservative pundits would offer up liberal scientists, journalists and artists as hate objects for their base," writes Amanda Marcotte for Salon. "This is a time of economic instability and ordinary people are seeing their fortunes declining," she adds. "It's easy to turn that anxiety into rage at people conservative audiences think have easy, charmed lives as coastal elites." Other commentators that the view that perhaps it's not about economic instability as it is a fear of educated voters. "The danger Tyson brings to the political structure, as he gains an increasingly large foothold in the popular culture, is the threat of an informed populace," writes Matthew Fleischer for the Los Angeles Times. "That may not sound radical, but the promise of a large, nerdy, young voting block that subscribes to Tyson's sentiment is a threat to the political status quo - certainly Republicans, but Democrats as well." The dark side of South Korea's education model - Although South Korea is renowned for its education system, the consequences of its success should not be overlooked, writes Se-Woong Koo for the New York Times. "Dominated by Tiger Moms, cram schools and highly authoritarian teachers, South Korean education produces ranks of overachieving students who pay a stiff price in health and happiness," he writes. "The entire program amounts to child abuse. It should be reformed and restructured without delay." Because of the emphasis on success, many South Korean students experience physical symptoms from the academic stress, Se-Woong says. "Before South Korea can be seen as a model for the 21st century, it must end this age-old feudal system that passes for education and reflect on what the country's most vulnerable citizens might themselves want," he writes. Deconstructing a default - Following Argentina's descent into its second default in 13 years, many scholars and commentators are left wondering how it could have been avoided. Although some have blamed predatory hedge funds or Argentina's high-rolling government, the Conversation's John Weeks says that Argentina's economic system may be the real culprit. "The massive debt accumulation resulted from the hapless attempt to maintain a one-to-one exchange rate between the national currency and the US dollar via a 'currency board'," he writes. "This neoliberal bright idea legally links the amount of national currency in domestic circulation with the US dollars held by the central bank (in this case, the Banco Central de la Republica Argentina)." Contrary to what many believe, says Weeks, default could be good for Argentina. "Default serves as the solution to an otherwise intractable problem, an unsustainable foreign debt." A green movement that China can't ignore - An increasing awareness of environmental issues in China has led to an unusual wave of local and uncoordinated protests, writes Stephen Vines for Al Jazeera. The Chinese government reported 712 "abrupt environmental incidents" in 2013 alone - more than a 30% increase over 2012. "These protests can be dismissed as part of a not-in-my-backyard syndrome," he says. "But they are also powerful reminders of public awareness over the environmental impact of manufacturing activity and the profound consequences of pollution." Although the Chinese government seems to be tolerating the environmental protests, "the big questions now are whether the current protest trend will continue to escalate". A nation at risk - Libya is at the brink of a civil war, but its citizens are more determined than ever for change, according to Hisham Matar in the New Yorker. It won't be an easy task, however, because of the lack of military and police forces and a democratic government, he says. "A revolution is not a painless march to the gates of freedom and justice," he says, "it is a struggle between rage and hope, between the temptation to destroy and the desire to build." Overcoming the turmoil that was created by former ruler Muammar Gadhafi will be difficult, but Libyans want it more than ever, he concludes. Israeli commentators debate whether to continue the ground operation in Gaza in the light of Palestinian civilian casualties. "International support for Israel is gradually declining. The British accuse us of war crimes, and also Germany says enough. It is difficult to ignore the scenes of ruination in Gaza." - Yoel Marcus in Ha'aretz. "It is impossible to bring about a political settlement in Gaza without a lever embodying force... The only lever that can work in the short term is military." -Oded Tira in Yisrael Hayom. Have you found an interesting opinion piece about global issues that we missed? Share it with us via email at echochambers (at) bbc.co.uk.